If H.P. Lovecraft’s dark view of the universe appeals to you, then Mark Samuels’ collection of short stories in this anthology will be right up your alley. There is a sinister world just veiled beneath the world we see every day … at least that’s how it is in the world where these tales reside. In this collection, relatively ordinary, but not always innocent, people discover dark and sometimes unpleasant things reside right here, right now, hidden from our view by the thinnest of gossamer veils. From an author who gets sucked into an anti-book demon cult to a man that discovers he’s infected with a deadly language, the tales within this compact book seem at times almost mundane, but by the time you reach the end, you are left feeling just this side of disturbing. Many are infused with hopelessness…that there is no way to escape the macabre fate of intergalactic mold or towers that appear only to the chosen. As a whole, the stories in The Man Who Collected Machen and Other Weird Tales weave a feeling of dis-ease, a sense that things are not well with the world and you better watch your back or you’ll find yourself confronted by the things that terrify you the most. The concepts behind many of the stories were intriguing. For example, the idea that a non-conscious biological organism could eradicate all life in the universe, spread throughout the galaxies by solar winds, was unsettling and fascinating at the same time. Another tale featured a protagonist that didn’t fully realize his own predicament until the very end. He even killed those like himself because he still saw them as terrifying other. When Samuels took the time to develop the plot and the characters, the stories worked very well. 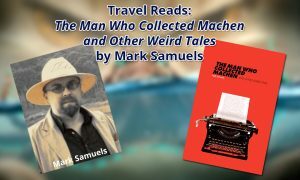 Samuels’ work has been compared to Arthur Machen, a welsh author who wrote tales of the macabre in the 1890s and early 20th century. And, at least to the degree that his style is very much of that time period … even when talking about things that happen in the modern world … this is true. Many of the short stories in this collection feel old … like the author was a contemporary of H.G. Wells (1866-1946) and Ambrose Bierce (1842-1913). There is a dated style to word choice and sentence structure that, in some cases, enhances the mood of the story, giving it a musty, decaying ambiance, but in most of them just distracted me from what was going on. The endings to many of the stories sneak up on you and drop in your lap in the last paragraph with a flourish. Sometimes this was effective, creating an “oh!” moment, but most of the time it just left me scratching my head and wondering, “What just happened?”. Individually, the stories are inconsistent, but get better the deeper into the anthology you read. The writing style keeps you at arm’s length from the protagonist and the things going on in the tale. Therefore, this collection is not for everyone … it is an acquired taste. Modern readers who are used to and prefer modern writers are advised to skip this book. However, if you don’t mind a little old school storytelling and are brave enough to open the closet door when you’re done reading a horror story, Samuels’ little anthology will take you to strange places and reveal divergent realities in unlikely places. Read my NY Journal of Books review here.